meters. At least 45 submitted written evidence for the record that may be viewed by the public (see below). Rep McMillin asked very astute and probing questions when the representatives of DTE, Consumers and MPSC were making their statements. The hearing did not get under way until 5:30 but continued to nearly 10 pm. House sessions to discuss with them the smart meter issues. Many who participated earlier were not able to attend the hearing due to the late starting time. The total number participating in the day’s events may well have reached 300. A preliminary transcript of the hearing should be posted on the Committee’s web page soon. Those of us who participated believe this hearing will serve as a catalyst to get a smart meter bill passed in the next legislative session. 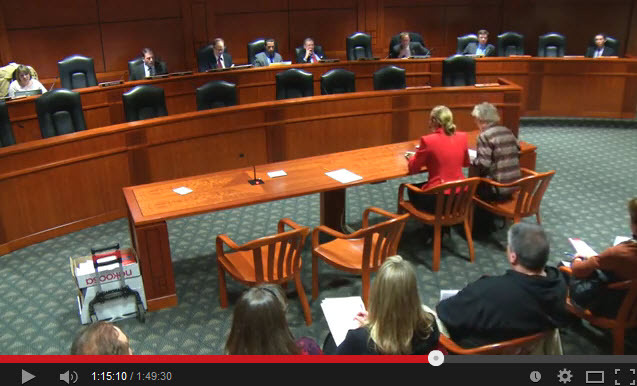 A video (youtube) of the entire hearing can be seen now by following the two links below. For your convenience, near the end of Part 1 a link appears on screen that will load Part 2. The above link will take you to the Oversight Committee page, where you scroll down to where there is a box that says “Testimony” and “Select One”. Clicking on the down arrow next to “Select One” will display a drop down list of all the people that submitted evidence (with the exception of a few folks who submitted evidence that was too massive to scan). Clicking on a name from this list will display that person’s submitted evidence. Note also there is a box with a drop down list where you can select and view the minutes for any meeting of this Committee. At this time, however, only the proposed minutes of a very short meeting that happened earlier in the day on December 2nd are up for viewing. 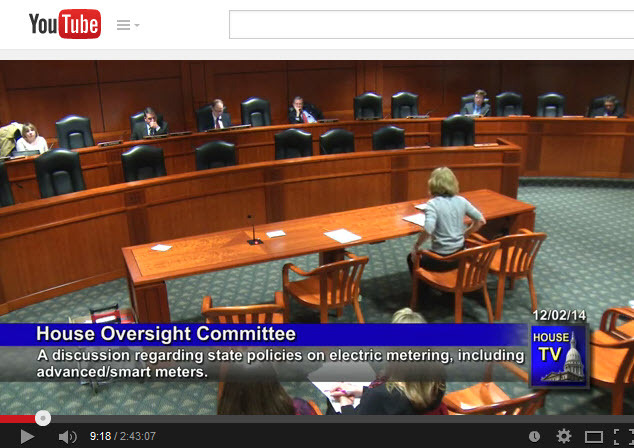 We are hopeful that the proposed minutes of the much longer smart meter hearing will be up within the next few days. This entry was posted in Actions by State Government, Public Meetings & Protest Activity and tagged Consumers Energy, Detroit Edison, DTE, DTE meters, Legal proof of smart meter health symptoms, Michigan Court of Appeals, Michigan Public Service Commission, MPSC decision found unreasonable, privacy law, Proving Smart Meter Health Claims, smart meter opt-out, surveillance device by Vigilant Dave. Bookmark the permalink. The hearing was filled with energy the entire day from protests on the capitol steps, lobbying the House and Senate and especially at the hearing. This was a power packed hearing and we are only growing in support. Thousands have signed petitions, over 35 cities are with resolutions and/or moratoriums. We had a 2 week notice to get as many as we could to the hearing. Tell me what other issue is this fast growing?. We got 200 people in 2 weeks…This is a very big deal and we are only getting stronger. 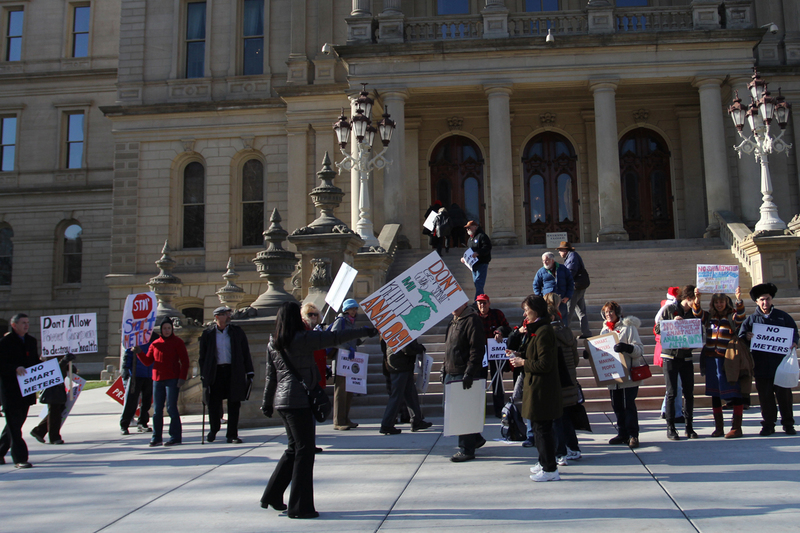 Kudos ALL who work towards Analog Meter freedom in Michigan..From just signing a petition to passing the word to your neighbor to protesting to LOCKING your analog up, IT ALL COUNTS !!!! GREAT JOB! Ralph – the written testimony is there – click on “Click here to access the written evidence submitted” above and go to the “Testimony” drop down box on the committee’s web page and see all the testimony…even 100+ page testimony is posted. There’s about 45 people who submitted written testimony. I don’t see any written testimony from you…you can call the clerk’s office and ask what happened (or call mine at 517-373-1773). David, No where does it say written evidence in the drop down box…….we have been trying to find what we submitted but unable to….Any suggestions……. Kudos to all that took the time and had the ability to attend the above hearing. I’ve just finished listening to it in it’s entirety. All were quite eloquent and informative and I sincerely hope the legislature actually heard our concerns and moves forward to protect our rights, privacy, health, children and welfare. I was hospitalized at the time or would have been in attendance as well. Thank you again for representing for all of us. You are to be commended. Thanks, Dave. You are a great asset to this movement.